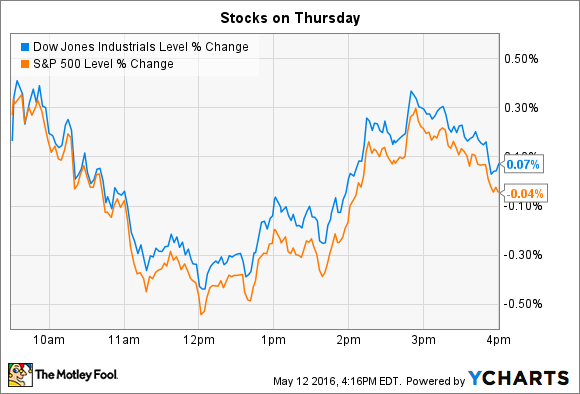 Indexes didn't move much on Thursday, but these two stocks sure did. Earnings reports from the retailing industry kept that sector in focus for the second straight day -- and not for especially good reasons. Kohl's (NYSE: KSS) shares hit a seven-year low following weak sales, and Ralph Lauren (NYSE: RL) only managed a slight recovery from the 35% decline shareholders have witnessed in the last year. Kohl's was the worst-performing stock on the S&P 500 after posting surprisingly weak first-quarter financial results. Profit was cut in half, and the retailer's revenue fell 4% at existing locations, compared to the 1% increase management has projected for the full 2016 fiscal year. "First quarter sales were challenging," CEO Kevin Mansell explained to investors in a press release. The huge profit decline was driven by the lower sales figure, but also by markdowns that Kohl's had to take in order to clear out excess inventory. While it succeeded in managing its stock, the pricing actions led to a decline in gross profit margin. Still, executives were pleased that their cost-cutting initiatives helped avoid what would have been an even larger drop in earnings. "We managed our expenses effectively throughout the quarter as every area contributed to our savings versus our plan," Mansell said. The 5% drop in store traffic isn't a good sign for the business going forward, as it points to further weakness ahead. Kohl's executives are taking a fresh look at their marketing plans while keeping up investments in a successful online ordering service, but this quarter's results make it seem unlikely that the retailer will enjoy any sales growth this fiscal year. Ralph Lauren's stock rose 3% after its Q1 earnings numbers beat Wall Street's low expectations. Sales were flat at $1.8 billion, or right in line with management's February guidance. The 37% decline in profit to $0.88 per share, meanwhile, was $0.05 above consensus estimates thanks to good expense and inventory management. The retailer's 1% sales drop in the U.S. market compares well to rivals, many of which have suffered declines of 5% or more over the last few months. Gross margin also held up at roughly 55% of sales even as the company cleared out excess inventory from the fall shopping season. Ralph Lauren takes those relatively solid results into what will be a closely followed investor day on June 7. New CEO Stefan Larsson has been conducting a comprehensive review of the retailer's structure, its selling strategies, and its growth approach. Shareholders will hear the results of that analysis early next month. Management, at least, sounds optimistic about the new direction the team is prepared to take. "We are looking forward to sharing the plan," Larsson said. "We are confident that [it] will strengthen the brand, drive sustainable profitable sales growth and deliver shareholder value." Investors apparently weren't as optimistic since Ralph Lauren's stock remains close to its 52-week low even after Thursday's bounce.